The US president says ‘we’re going to keep families together’ after facing huge backlash for his ‘zero tolerance’ stance. United States President Donald Trump on Thursday signed an executive order to end separation of immigrant families at the border, after images of children in cages sparked global outrage. Trump signed the executive order following widespread protests against the move of his administration to separate children from their parents who illegally enter the country. 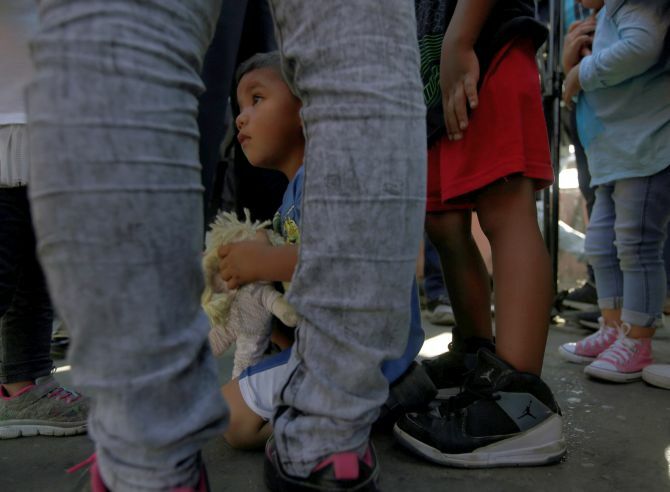 In recent weeks, more than 2,500 such children were separated from their parents. “We’re keeping families together, and this will solve that problem. At the same time, we are keeping a very powerful border and it continues to be a zero-tolerance. We have zero tolerance for people that enter our country illegally,” Trump told reporters in the Oval Office of the White House as he signed the executive order. The executive order, signed by Trump, asks the Department of Homeland Security to keep families together while people await trial for illegal border crossing. But cases where there is a concern that parents “would pose a risk to the child’s welfare” have been exempted from the executive order. Trump said the executive order is about keeping families together while at the same time making sure that they have a very powerful and strong border. “And border security will be equal, if not greater than previously. We are going to have very strong borders, but we’re going to keep the families together,” he said. Trump said he didn’t like the sight or the feeling of families being separated. “It’s a problem that’s gone on for many years, as you know, through many administrations. We are working very hard on immigration. It’s been left out in the cold. People haven’t dealt with it, and we are dealing with it,” he said. Trump’s opponents, however, were not satisfied with the executive order, asserting that this was not enough. “The President’s Executive Order seeks to replace one form of child abuse with another. Instead of protecting traumatised children, the President has directed his Attorney General to pave the way for the long-term incarceration of families in prison-like conditions,” said Democratic Leader Nancy Pelosi. “It is particularly galling that President Trump seeks to continue violating children’s human rights to justify and gin up support for the anti-family language included in Speaker Ryan’s anti-immigrant bill,” she said. Pelosi said using terrified small children as “leverage” to push the President’s anti-immigrant agenda represents an “unspeakably appalling moral low-point for our nation”. Top Democratic leader Congressman Joe Crowley said while this order stops the separation of children from their parents, it does not end the administration’s despicable policy of unreasonably detaining asylum seekers and families fleeing violence. “Instead of pushing legislation that endorses the Trump administration’s policy of detaining families, House Republicans should join Democrats in calling for an end to the policy and in making sure we reunite the families that have been ripped apart,” he said. “The thousands of children who have spent days, weeks, and months without the love and support of their parents deserve nothing less,” Crowley added. Republican Senator Marco Rubio welcomed the executive order. “But Congress still needs to act because what they’re doing, while very humane, violates something called the ‘Flores Settlement’, which means someone’s going to take this to court and they’re going to get it thrown out,” he said. On Wednesday, Rubio introduced a bill that basically allows people who unlawfully entered to the country to be held together with their children. “And we also add new judges so that we can expedite the hearing they’re entitled to, and dispose of their case either by sending them back together as a family or admitting them into the country as a family. We have to act and I hope we can pass that law,” he said. Anastasia Tonello, president of the American Immigration Lawyers Association said the detention of families -- parents and children -- who pose no flight risk or danger to the community is simply “unacceptable, abrogates international responsibilities to refugees, and goes against our country’s most fundamental values”. “We need to embrace our legacy as a safe haven for the persecuted and stop subjecting bona-fide refugees to further trauma by locking them up while they pursue their lawful claims to relief,” Tonello said. Padma Lakshmi has a message for Trump. Who's listening?